Soak lentils over night; drain; add one quart fresh water and one teaspoon of salt. Cook slowly until tender. Add other ingredients. Steam or bake for 45 minutes. Mix all ingredients. Bake in greased dish slowly for one hour. Mix all ingredients thoroughly. Bake in covered casserole slowly for one hour. Mutton should be cut in about one-inch pieces. To cornmeal add one-half cup of cold water. Boil three cups of water and add cornmeal. Boil five minutes. Add other ingredients. Cook in greased baking dish for one hour. Soak beans over night; drain. Cover with fresh water and the soda and boil, until skins break, but do not let beans become broken. Cut rind from salt pork and cut into six or eight pieces. To 1 cup of boiling water add the cayenne, salt, molasses, mustard and tomatoes. In bottom of bean pot place the onion and a piece of salt pork. Add beans. Pour over this the seasonings. Cover the beans with boiling water. Bake three hours covered. Uncover, put spinach to which has been added 1 teaspoon of salt, 1 tablespoon of vinegar, one-eighth teaspoon of pepper, on top. Bake 30 minutes and serve. One cup of kidney beans, soak over night; drain. Cover with fresh water. Add 2 teaspoons of salt, cook in small amount of water until tender. Force through colander. Measure 1½ cups and add one-quarter pound salt pork chopped fine, 1 teaspoon Worcestershire sauce, 1 cup of water or meat stock or gravy. Place half of mixture in greased baking dish. Cover with two cups of spinach, to which has been added one-quarter cup of vinegar, 2 tablespoons of fat and one-half teaspoon of salt. Cover with other half of bean mixture. Bake 20 minutes. Cook macaroni until tender in one quart of boiling water and one teaspoon of salt; drain. Melt fat, add flour, salt and cayenne. Gradually add tomatoes and when at boiling point remove from fire, add cheese and peas. Place macaroni in greased baking dish, pour sauce over it and bake 30 minutes. Melt fat until brown. Add flour and seasonings. Heat until brown. Add milk gradually. When at boiling point add other ingredients. Place in baking dish and bake 45 minutes. Cut fish into small pieces. Cover bones, fins and head with cold water. Simmer 15 minutes; strain. Cook onion and salt pork until brown. In kettle place layers of fish and mixed vegetables. To water in which bones, etc., have been cooked, add the seasonings. Mix all ingredients. Cook forty minutes, slowly, covered. Pour 1 cup of boiling water and one-half cup of boiling milk over fish. Let stand one-half hour, pour off liquid. Place fish in baking dish. Place samp on fish. Mix other ingredients and pour on top. Cover and bake three-quarters of an hour. Blend flour with 2 tablespoons cold water. Dissolve bouillon cubes in the boiling water. Mix all ingredients. Place in casserole and bake 45 minutes or until spaghetti is tender. Mix cornmeal with one-half cup of cold water. Add to the boiling water. Boil five minutes. In greased baking dish place fish which has been soaked over night. Place pimento on fish. Place cornmeal on pimento. To tomatoes add seasonings and pour over all. Bake slowly 45 minutes. One-half cup dried peas, beans or lentils, soaked over night and cooked until tender. Melt the fat. Add the seasoning; gradually the liquid. Add the vegetables. Cook 20 minutes. Serve very hot. This is an especially good way of adding the necessary flavor to lentils. 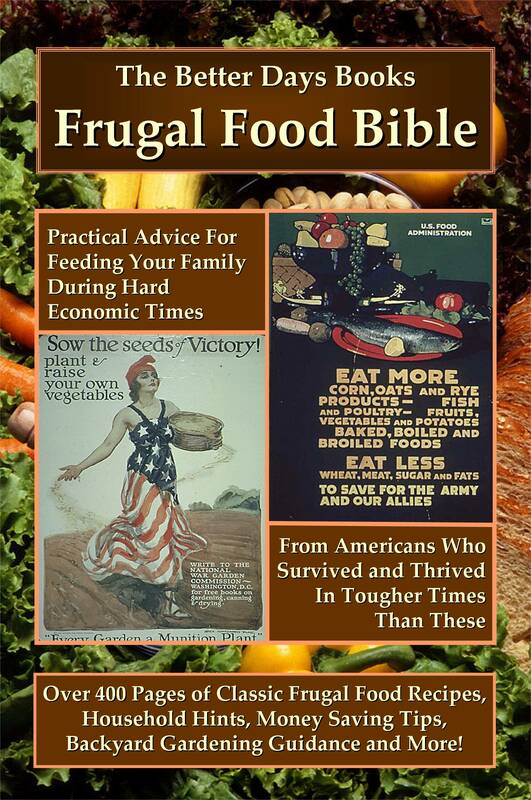 The Better Days Books Frugal Food Bible: Practical Advice for Feeding Your Family During Hard Economic Times From Americans Who Survived and Thrived In Tougher Times Than These contains more than 400 pages of classic frugal food recipes (including 47 varieties of War Bread! ), household hints, money saving tips, backyard gardening guidance and more! The Better Days Books Frugal Food Bible is available from the publisher at www.BetterDaysBooks.com, or from Amazon.com and other fine on-line booksellers. Ten sweet, satisfying, yet sugar-free dessert recipes from The Better Days Book Frugal Food Bible! Let stand until milk is absorbed. Mix and bake 45 minutes. Soak fruit in water 1 hour. Add other ingredients. Cook directly over fire 5 minutes, then over hot water until clear, about 45 minutes. Mix eggs, corn syrup, salt and milk. Dip bread and brown in frying pan. Spread with marmalade or preserves. Pile in baking dish. Cover with any of the custard mixture which is left. Cover with meringue. Bake 15 minutes. To prunes, add ½ cup water and soak 10 minutes. Simmer in same water until tender (about 10 minutes). Drain prunes and mash to a pulp. Mix flour, baking powder and salt. Add beaten egg and milk. Mix to a dough. Roll out thin, spread with prune pulp, sprinkle with two tablespoons sugar. Roll the mixture and place in greased baking dish. Bake 30 to 40 minutes. Take half cup of juice from prunes, add 1 tablespoon corn syrup. Bring to boiling point. Serve as sauce for prune roll. Mix cornstarch with ¼ cup of cold milk. Scald rest of milk, add cornstarch, and stir until thick. Cook over hot water 20 minutes. Add rest of ingredients. Cook, stirring 5 minutes. Chill and serve with two whites of eggs, beaten stiff, to which has been added 2 tablespoons orange marmalade. Two ounces grated chocolate and ⅓ cup corn syrup may be substituted for marmalade. Soak gelatin in cold water until soft. Add coffee and stir until dissolved. Add other ingredients. Chill. One-quarter cup of marshmallows may be cut up and added just before chilling. Soften the gelatin in 2 tablespoons of the juice or water. Add the rest of the fruit after it has been heated. When the gelatin is dissolved, add the fruit, lemon juice and corn syrup. Pour in mold. Cook over hot water until thick, and boil or bake 20 minutes. Serve with hot maple syrup. Fill cored apples with 1 tablespoon honey, corn syrup, chopped dates, raisins, marmalade, or chopped popcorn mixed with corn syrup in the proportion of two tablespoons of syrup to a cup of corn. Put one-quarter inch of water in pan. Bake until tender and serve apples in pan with syrup as sauce. Core apples. Cut just through the skin around the center of the apple. Fill the center with popcorn and 1 teaspoon of corn syrup. Bake 30 minutes. The Better Days Books Frugal Food Bible: Practical Advice for Feeding Your Family During Hard Economic Times From Americans Who Survived and Thrived In Tougher Times Than These contains more than 400 pages of classic frugal food recipes, household hints, money saving tips, backyard gardening guidance and more! Enjoy these real vintage WWI era War Bread recipes from The Better Days Book Frugal Food Bible! Beat well. Put in greased covered molds, steam 2 to 3 hours. Dissolve yeast cake in water, add remaining ingredients, and mix thoroughly. Let rise, shape, let rise again and bake. Beat thoroughly. Bake in greased muffin pans 20 minutes. Scald cornmeal with boiling water. Soak bread in cold water and milk. Separate yolks and whites of eggs. Beat each until light. Mix ingredients in order given, folding in whites of eggs last. Bake in buttered dish in hot oven 50 minutes. If it seems like every time you walk into a grocery store all the prices have gone up, rest assured, you’re not imagining things. In the one year period prior to this writing (2007-2008), the cost of a gallon of milk in America has increased by 26%, and we’re paying 40% more for a carton of eggs. A combination of forces, including increased global food demand, bad weather in the American farm belt, and dramatically increased (and often government-mandated) production of grain-based biofuels like Ethanol have, during that same year, caused the price of corn to double, and wheat to triple, impacting the price of every food product in which these grains are used as ingredients. Add to that the nearly 500% increase in the price of diesel fuel since January, 2000, a cost that gets added to the shelf-price of every product trucked to retail grocers throughout the nation, and it becomes clear that we are facing a nationwide food cost crisis. But not necessarily one of “unprecedented proportions.” As bad as things are (or could become – experts predict food prices in America will continue to increase by 7.5% yearly, with no end in sight! ), the present food crisis is by no means the first time Americans have faced financial hard times or issues of food scarcity. From its very beginnings, our nation has experienced a long series of economic panics and depressions with devastating repercussions for middle and lower class families. In 1832, the year in which Lydia M. Child’s The American Frugal Housewife (the opening volume of this collection) saw initial publication, President Andrew Jackson refused to renew the charter of the Second Bank of the United States, fostering the nationwide collapse of the banking system. Before the year ended, one third of all manual laborers were jobless in New York City alone, and the national unemployment rate reached a staggering ten percent. In 1873, more than 10,000 businesses failed as an economic depression raging in Europe spread to our shores. In 1874, a grasshopper invasion in the Middle West and a potato-bug blight in the East destroyed most grain, corn, and potato crops, forcing farmers to leave their homesteads in search of work. World War I left millions starving all around the world, and America embraced the heroic cause of food conservation with religious fervor – our Government even issued posters proclaiming the wasting of food “The Greatest Crime in Christendom.” And everyone remembers the historic Stock Market crash of 1929, which launched America’s “Great Depression” of the 1930s-1940s. During all those past crises, Americans not only survived, many thrived in the midst of hard times through a unique combination of ingenuity, pragmatism and sheer, American pluck that has always defined the spirit of our nation and our people. The difficulties of our own day call on us to do the same, and there is no better place to find the inspiration and practical, down to earth advice we’ll need to succeed in the present than in the writings left to us by great Americans of the past. The economic and food crises we face in 21st Century America are very real and frightening in scope, but it is not the purpose of this book to wallow in insecurity or fear. We have compiled The Better Days Books Frugal Food Bible, instead, to revel in the genius of Americans past, and to make their pragmatic wisdom freely available, once again, to modern Americans in our hour of need. While most of us will surely survive our nation’s present hard times, this book is dedicated to those who would choose, instead, to thrive by taking control of their food budget, making wise food purchasing and preparation choices, both for economy and for health, and by “thinking outside the box” of the eating habits they may have known since they were children – habits which, in the present economy, are simply no longer sustainable. For those who understand the significance of home-grown foods to surviving and thriving in difficult times, yet who may have little knowledge or experience of gardening technique, or who have access only to small urban or suburban yards or community gardens, we have included F. F. Rockwell’s Home Vegetable Gardening: A Complete And Practical Guide To The Planting And Care Of All Vegetables, Fruits And Berries Worth Growing For Home Use, which may be the best single volume, practical manual of family-feeding, high-yield home gardening ever compiled. These three classic volumes work in harmony to reveal the “can-do!” temperament that has traditionally lifted Americans above the simple facts of hard times, while simultaneously offering hundreds of pages of no-nonsense advice, delightful recipes, culinary wisdom, and hands-on “how to” instructions for bringing frugality into every aspect of the family diet. The present work, though written upon strictly vegetarian principles, is by no means addressed to vegetarians only. On the contrary, we hope that the following pages of recipes will be read by that enormous class throughout the country who during the last few years have been gradually changing their mode of living by eating far less meat… Where there are thousands who are vegetarians from choice, there are tens of thousands who are virtually vegetarians from necessity… only those who have tried a strictly vegetarian course of diet know what real economy means. As the price of corn (the prime ingredient in most domesticated animal feed) increases exponentially, so, too, must rise the cost of meat and poultry products. Soon, no one with a frugal eye for their food budget will even consider their purchase for day to day consumption. What makes Cassells Vegetarian Cookery such a fabulous addition to this volume is the author’s clear understanding that, for those who choose a meatless diet out of necessity (rather than philosophy), the most important factor is flavor. We want foods that taste good, that are familiar, reliable, “down home.” To satisfy this desire, Payne wraps his recipes in savory sauces and other culinary devices geared to make meatless food richly attractive to the meat-trained palate. Learn More at www.BetterDaysBooks.com. The Better Days Books Frugal Food Bible is also available through Amazon.com and other fine on-line booksellers. An Excerpt from Our American Holidays: Their Meaning and Spirit, from Better Days Books. A feeling of this nature came over Frank that morning, and he called out, “There’s another!” every time a new flag came in view. He stopped two or three times to count the number of them in sight, and showed in various ways that he, America, and the American flag had come to a new understanding with one another. During the morning, Frank’s cousin George, a boy two or three years older than Frank, who had been in Paris the preceding winter, came to our hotel; and, as I had some matters to attend to in the afternoon, they went off together to see sights and to have a good time. “George had two,” he said in answer to my question; “and he gave me this one. He’s been in Paris a year now, and he says we ought to wear them or maybe people won’t know we’re Americans. But say, Uncle Jack, where do you think I got that?” He opened a paper bundle he had under his arm and unrolled a weather-beaten American flag. “Where?” asked I, naturally supposing it came from George’s house. “They ought to put a new flag on every year, George says,” explained Frank, seeing my amazement, “on Fourth of July morning. But the American Consul, or whoever he is that’s here now, is a new man, George thinks; anyhow, he forgot to do it. So we bought a new flag and we did it. “We went to a store on the Boulevard, and for twenty francs bought a new flag just like this old one. George and I each paid half. There were two women and a little girl at the tomb when we got back, and we waited till they went away. Then we unrolled the new flag and took the old one off the tomb. “We thought we ought to say something when we put the new flag on, but we didn’t know what to say. George said they always made a regular speech thanking Lafayette for helping us in the Revolution, but we thought it didn’t matter much. So we just took off our hats when we spread out the new flag on the grave, and then we rolled up the old flag and came away. “We drew lots for it afterward, and I’m going to take it back home with me. Right or wrong, the flag that travelers see on Lafayette’s tomb this year, as a mark of the American nation’s sentiment toward the great Frenchman, is the one put there by two small, self-appointed representatives. And the flag put there the year before, with fitting ceremony by the authorized official, Frank preserves carefully hung up on the wall of his little room in America. Our American Holidays: Their Meaning and Spirit is available in quality hardbound, sturdy trade paperback and convenient PDF Adobe Acrobat Reader e-book download formats from Better Days Books, starting at just $3.95. The e-book download edition is also available formatted for the Amazon Kindle. Final Entry (#39) in the Raising Great Americans Project! Click Here to learn More! Voters are the uncrowned kings who rule the nation. A second-rate man can never make a first-rate citizen. Every good man in politics wields a power for good. If you want a clean city, vote to place the government in clean hands. and that the nation is merely an extension of his family. We may now proceed to bring our studies to a close. All that has been said, from the beginning, has been gradually but surely focusing itself upon a single point; for the development of all these several faculties and powers leads directly to the forming of a well-rounded and fully-developed manhood. A fully-developed manhood is the highest possible human achievement, and includes within itself all that can be desired; and for this higher manhood we now make our final and most urgent plea. The real man is discovered in the sum total of his ideas; for it is in these that his life takes shape and character, it is in these that his true self comes into view. The real power of the true man lies in his being able to turn his thoughts inward upon himself; to so gauge and measure his own powers as to put them to the best uses; and to stand aloof from those positions and practices for which he finds himself to be unfitted. The simple application of this rule to the practical affairs of today would diminish the number of our machine politicians by about four fifths. We are loaded down, almost to the breaking point, with politicians who do not understand politics, and who advocate measures which are not for the public good, because the public good is not the end for which they strive. But the fault is in the men themselves, rather than in our political system. They must first be made manly, before they can be made truly useful. They must first learn to govern themselves, before they can successfully carry forward the work of governing the nation. They must be taught that bluster is not argument, and that to go through the motions of political service does not in the least aid in the promotion of the public welfare. A single service rendered from the heart is often of more value than a whole life of noisy and showy pretense; but again we say that such service is almost always the result of a thoughtful and considerate manliness. All this applies with equal force to the private citizen. A sturdy but quiet independence; a genuine love of righteousness and truth; a life of uprightness and integrity, of honesty and fair dealing; an absence of cringing and paltering, and of that miserable and contemptible fawning upon the rich, and that silly and despicable worship of those in place and power, which is too frequently to be observed;–all these things, and others, must receive care and attention before the ideal stage of manhood can be reached. The manly man is a thinking being. By this we do not mean to say that he imagines that he is running the universe, and that no one but himself is acquainted with the secrets of its mechanism; but that he has a right to weigh all questions in the scales of his own reason, and to draw his own conclusions from the facts presented to his mind. If he be truly a man, he will hold to that which he feels to be true against all opposition, but will, with equal readiness, yield in all points where he discovers himself to be in the wrong. Instead of going through life in political leading-strings, bending to the will of one man, and gulping down the opinions of another, he will stand upon his own feet, put his own vertebral column to its legitimate use of sustaining his body, and his own mind to its legitimate use of directing the issues of his life. The ideal citizen will also be a gentleman. By this term, we do not mean the milk-and-water, kid-gloved creature, who so often attempts to pass muster in this connection. All that we have asked for in the man, we insist on in the gentleman. Sturdy independence, vigorous thought, mental and moral uprightness, and a backbone as strong as a bar of steel,–but all tempered with a gentleness of disposition and a courtesy of manner which brings every natural faculty and power beneath its sway, and yet leaves principle and righteousness entirely undisturbed. The real gentleman is, above all else, courteous and considerate. He is master of himself, and that at all points,–in his carriage, his temper, his aims, and his desires. Calm, quiet, and temperate, he will not allow himself to be hasty in judgment or exorbitant in ambition; nor will he suffer himself to be overbearing or grasping, arrogant or oppressive. The ideal citizen will also be, in the better sense of the word, a politician. Be careful to note here that we say, a politician in the better sense. We would have you distinguish, with the utmost clearness, between a politician and a partisan. The true politician, looking ever to the highest interests of the state, is a public benefactor; while it very frequently happens that the mere political partisan is a public nuisance, if not a public disgrace. The man who sinks his country’s interests in his own, and the man who sacrifices his personal advantages for the sake of his country’s good, stand at the very opposite poles of human society. The man who swears by party watchwords, and moves amid the burning animosities of party strife, is centering his life in interests which may vanish like an evening cloud. Not in the loud clamors of partisan struggle, are we to find the secret highways which lead to national prosperity and progress, but in that quiet, thoughtful, careful study of the interests and events in which the national life is taking shape and color, and in the application to these of the great principles of righteousness and common sense. This is about equal to saying that the ideal citizen will be a patriot. We have so mixed in our minds the two distinct ideas of patriotism and heroism, that we have need to pause for a moment, that we may disentangle ourselves from the meshes of this net of misconception, before we venture to proceed. If we call for an illustration of patriotism, you point us to some Horatius or Leonidas of the olden times; or to some William Tell, or Ulysses Grant, of these more modern days. We do not say that these men were not patriots, and patriots of a high order too. But their circumstances were exceptional, and under these exceptional circumstances their patriotism made them heroes. But if you will enter into a careful study of the matter, you will find that it is the heroism, quite as much as the patriotism of their lives, which takes so strong a hold upon your hearts. We therefore desire to place by the side of our beloved Grant, the man who, in the midst of a bitter struggle for bread, can barely manage by the closest possible economy to keep his family from want and shame, but who still sacrifices an hour’s wages that he may go to the polls and vote the expression of his will, and thus support the measures which he honestly believes to be for the public good; and we desire to say that, on the ground of a true patriotism, we consider that the one is fully the equal of the other, and that there is a sense in which the man of smaller opportunities is the greater hero of the two. There may be a thousand definitions of heroism, but the patriot is simply “a man who places his country’s interests before his own.” He is a patriot who fills well his station in life whether public or private, who loves peace and promotes order, who labors to uphold the good and to put down the bad. He is a patriot who uses all his advantages of friendship, acquaintance, business connection, social position and the like, in such a manner as to make these helps and not hindrances to his country’s progress. He is a patriot who seeks to aid in all movements that look to the instruction, elevation, and permanent betterment of his fellow-citizens, and to put down all such movements or institutions as tend to demoralize and degrade them. Such is the patriotism we plead for; and such patriotism and ideal citizenship are, in our minds, just one and the same thing. This Article is an Excerpt from You Can Be a Great American! 39 Steps to True and Lasting Greatness (a Growing Up Great Guide for American Boys and for the Parents and Teachers Who Love Them), by W. F. Markwick and W. A. Smith, which is available from Better Days Books in quality hardbound, sturdy trade paperback and convenient .PDF e-book editions starting at just $4.95. Industry, Ambition, Self Control, Self-Respect, Courtesy, Faithfulness, Courage, Duty, Honesty, Enthusiasm, Humility, Patriotism… In every era of our Nation’s history, the true alchemy by which ordinary boys have been transformed into Great American Men has always and only occurred where these indispensible moral principles have been successfully applied. In an age like our own, where such manly ideals are openly mocked and derided by our popular culture, it’s time to turn to the past to recapture a clear vision of what it takes to be a Great American, and the true moral and ethical ladder that leads reliably to its attainment. You Can Be a Great American: 39 Steps to True and Lasting Greatness was first published in 1900, under the title The True Citizen, How to Become One, and contains 39 essential lessons in manhood tailored to each age and transition in a boy’s life, from infancy to adulthood. It is the clearest roadmap to American Greatness ever compiled for the youth of our Nation, and remains as life-changing today as it was when first published, over 100 years ago. Whether you are an adult raising boys in a Traditional family setting, the single parent of a son, or a boy abandoned to no or poor parenting, left to grab your own bootstraps and lift yourself up to a life of achievement, success and All-American Greatness (or an adult who knows a boy in such sad straits), You Can Be a Great American! : 39 Steps to True and Lasting Greatness is the only guidebook you’ll ever need. Also available through Amazon.com in quality trade paperback and Kindle e-book download editions. Entry #38 in the Raising Great Americans Project! Click Here to learn More! Love your country and obey its laws. The sum of individual character makes national character. The true defense of a nation lies in the moral qualities of its people. Everything learned should be flavored with a genuine love of country. Noble ideas of citizenship and its duties strengthen the will of all patriots. We are accustomed to say that our American government is “a government of the people, by the people, for the people.” It is largely in this, its broad, comprehensive, and democratic character, that we so often venture to hold it up to view as a model which might be copied by the surrounding nations to their very great advantage. And certainly no thinking person will deny that we have much to be justly proud of in this respect; for our nation has neither parallel nor equal upon the face of the green earth. But in a land like this, where the government is formed by its citizens, it can only be maintained by its citizens. Offices thus created must be filled, and the ship of state must be manned, and manned with a careful, honest, and patriotic crew, or it will be in danger of total wreck. In our times of peril we have been quick to see and to acknowledge this; and, more than once or twice, the nation has been saved by the prompt and patriotic action of the people. But it is not so easy a matter to keep our patriotism up to its noblest and its best when there is an absence of unusual or exciting causes to call it into play. We must therefore glance briefly at both these aspects of the case. It is a requirement of long standing that, in case of war, every able-bodied citizen must go forth as a soldier, if the government shall so demand. He must, if really needful, help to save the state, even at the risk, or at the positive loss, of his own life. Such calls have been made by our government; and the manner in which our people have responded has been the glory of our nation and the wonder of the world. The citizen must share the risks of his country, as well as its benefits. He must be willing to give protection to the rights and interests of his fellows, or he cannot rightly expect protection for his own. In this we are all so far agreed as to render anything like an argument entirely unnecessary; and we do not hesitate to brand all who fail us, under such circumstances, as unpatriotic and unworthy of the sympathy and esteem to which faithful citizenship entitles men. Now look at the other aspect of the case. The public service is not only for times of war and tumult, but also for times of prosperity and peace; and the claims of the nation are no more to be slighted or shirked in the latter case than in the former. The ship of state must be manned, we say, and the public offices necessary to prosperity and progress must be filled. Many of these suffer unless filled by able and patriotic men; and the interests, for the preservation and forwarding of which these offices have been created, cannot be properly served. The crying need of today is for men of public spirit; for men who will seek the highest welfare of their fellow-citizens in general; men of broad and generous views; men who look out upon life with an absence of that littleness and near-sightedness which cannot distinguish between public good and private interest. Those men who will take no position in the service of their country, unless it is accompanied with a monetary compensation, are after all, very closely akin to the men who waited until bounties were offered before they would take service in connection with the Civil War; while, on the other hand, the men who are truly public-spirited, take pleasure in serving the public and are liberal beyond the requirement of the law. It has been well said that “A public office is a sacred trust.” Whoever engages in any duties of a public nature, is under the most solemn obligation to do those duties honestly and well. There are some public officials who, because they aid in the making of the laws, appear to think themselves higher than the law, and therefore at liberty to obey or to neglect its requirements, according as their personal inclinations shall direct. But this is not so; and it should be made clear to all such persons that they are in error. The legislator is but a citizen, after all; and, as a citizen, he stands in precisely the same relation to the law as does his brother of the rank and file. Of all men, he should be obedient, and should labor to surround the law with every possible safeguard; for it is among the most precious and sacred of our earthly possessions. It is the charter of all true freedom. It is a power before whose awful majesty every man must bow, irrespective of outward position or personal influence. It must be reverenced, honored, and obeyed by all. Now the facts show that there is a strange ignorance, or else a strange lack of conscience, in this matter, and that this is so widespread as to be almost universal. It seems to be a common opinion that there is no particular harm in cheating the government. If a politician secures a high government position, or a business man is fortunate enough to secure a large government contract, it seems to be expected that he will secure from these sources larger profits than would be possible anywhere else. In other words, it seems to be expected that the government will pay more for any service than can be obtained from an individual or from a private corporation, and that men will charge prices, and use deception and fraud when they work for the country, which if practiced upon private parties, would send them to prison and brand them with lifelong disgrace. One of the most ominous signs of the times is that good men stand aloof from politics. They do this either because they do not fully appreciate the importance of their influence, or from the false conviction that their votes will do no good, or, in many other instances, because they consider their private business to be of more importance than the matters of the state. But, in point of fact, the uplifting of the moral tone of our country is a service of the most importance; and, even if we consider ourselves alone, it is still true that we cannot afford to pass it lightly by. Surely all that is worth preserving. Surely we will not allow so rich a heritage to run waste. Surely we will support a nation whose past is bright with glorious achievements, and whose future glows with the light of a promise so radiantly beautiful. We need only remind you, therefore, that the truest and most useful citizens of our country are those who invigorate and elevate their nation by doing their duty truthfully and manfully; who live honest, sober, and upright lives, making the best of the opportunities for improvement that our land affords; who cherish the memory and example of the fathers of our country, and strive to make and keep it just what they intended it to be.